Looking for an out-of-the-box bonding activity? Located at 619 Foster St. in Durham, Urban Axes has you covered. 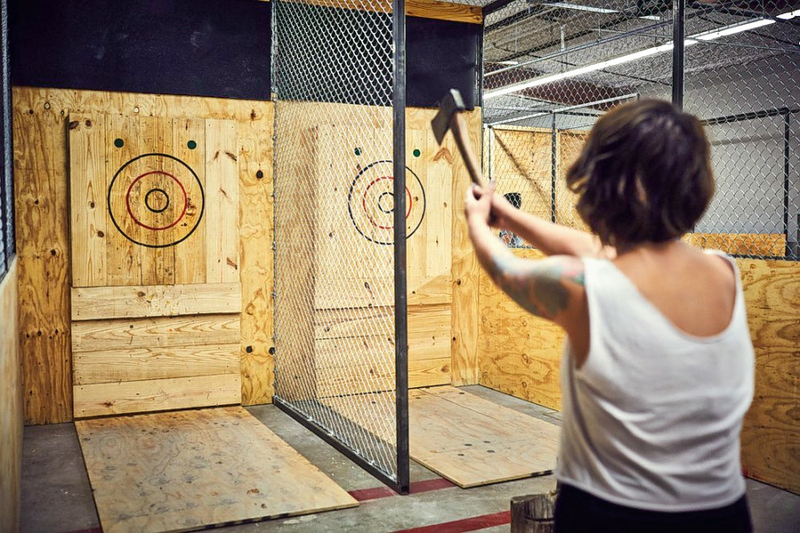 The ax-throwing chain, which serves those 21 and over, has locations in Philadelphia, Austin, Baltimore, Boston and more. At the local outpost, trained coaches will teach you how to throw axes at targets and help you sharpen your skills. Stop by for a walk-in throwing session (see schedule here) or book a spot for competitions, team-building activities, birthday parties and more. There's also an on-site bar that serves beer and wine. With a five-star rating out of four reviews on Yelp so far, the newcomer is on its way to developing a local fan base. Lilly W., who reviewed the business on Oct. 12, wrote, "We visited Urban Axes last night for the first time and we had such a great time! Our instructors did such a great job teaching us. They literally walk you through step-by-step and show you how to throw axes!" And Ela S. wrote, "We came to Urban Axes in Durham for a friend's birthday celebration and had the best time. Who knew throwing axes could be so fun?"